This post started out as not being a book review. Why? I was saving my copy of the Handmade Marketplace. For what? The perfect time of course! I'm a saver. I have been all my life. Toast with jam? I turn the piece of bread around and around and eat the crusts first, saving the middles of jam goodness. Lasagna with cheese on top? I eat all the layers of pasta first and save the crunchy baked on top last. A part of it probably comes from growing up and being told that I had to eat the entire dumpling and not just the outside. So, I ate all the insides of the dumplings and saved the outside "dough skin" for last. Funny thing is that when I got older, I still do this until one day, Robert said "You paid for that dumpling. You don't have to eat the inside if you don't want to". Wow. That was seriously a lightbulb moment! A friend of mine raved about Kari and her book when it first came out. 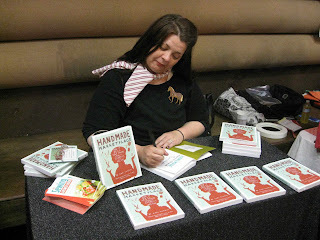 She's not only one of the amazing contributors in the Handmade Marketplace, but she flew to Etsy's headquarters in New York City to be a part of a panel discussion for the Etsy Speaker Series along with Kari Chapin, Betsy Cross, Jennifer Judd-McGee and Liz Smith (all featured in the book). After hearing all these great things about Kari, I was a bit star struck to finally meet her at her Putting Together A Press Kit session in June as part of the Summit of Awesome. At the end of class, I sheepishly made my way to the front, introduced myself and tried to stay cool. So eventhough I wanted to save the book and read it at just the right moment. I ended up devouring it last night which is why I said that the post started off as not being a book review. This is a fantastic resource to people who make stuff and sell their items at fairs or online. She talks about developing your brand and logo, pricing your work, marketing, using social media and selling at craft fairs / online marketplaces / retail stores. The book is well laid out and easy to read with cute illustrations by Emily Martin (a.k.a. The Black Apple) and Jen Skelley. Kari also includes a few Q&A sections with some amazing people in the handmade industry including Matt from Etsy and Holly from decor8. Check out Kari in the picture above signing a copy for me in Portland last June at the Show of Awesome. Actually, I forgot to take a picture when she was signing, so I made her pretend to re-sign it for the blog. Ha!